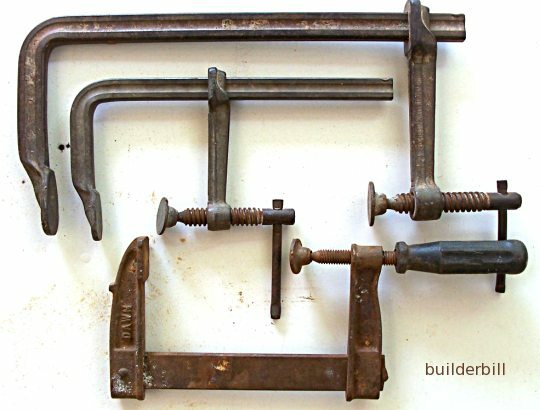 Carpentry clamps in the shape of an "F", also known as bar clamps. I have said before that you can never have enough clamps and that is true. The temptation when there is a need for half a dozen new clamps, is to cut costs and buy cheap ones. Years ago I did just that and a cheap clamp gave way one time and dropped a temporary steel angle brace onto my shoulder. No real damage done to me and the steel column that it was holding stayed in place, but it could have been a lot worse. That's when I bit the bullet and bought eight of the big Bessey clamps shown above. I have never regretted it. What happens is the grip that the moving part has on the bar is so good that when they are really tightened one can feel the bar flexing and building up tension. This grip holds even when the whole thing is vibrated. 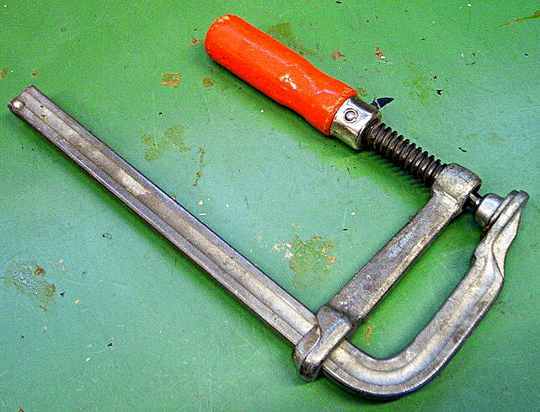 A Bessey clamp with the handle suited to carpentry and joinery work. I call these clamps "F" clamps because I have been calling them that for the last forty years. Some manufacturers call them bar clamps. Unlike the all steel ones above, these are well suited for bench work and outside carpentry work.